My grandson Matthew helping decorate the Christmas tree. I used all my old Christmas tree with child photos in past posts. We do not seem to have taken many pictures of children on Christmas for some reason, although there are plenty of pictures of older people and Christmas trees. Maybe the photographers were too involved in the moment. Merry Christmas Sis! ? Matthew is such a cutie! Merry Christmas True. He is a cutie. Great photo. 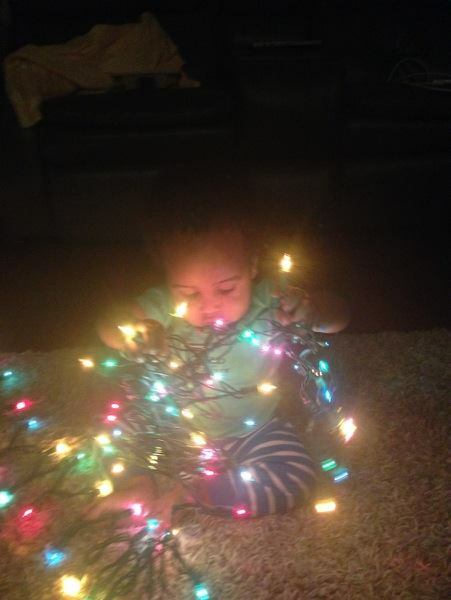 Never too young to learn how to untangle those lights. Very true. I may need him over here to do mine. What a great picture – a darling boy all aglow! And yes, it’s never too soon to learn how to untangle lights – a bit akin to untangling yarn! That photo could be from any year. If you really have to untangle lights, it’s probably safest to do it with them turned off, but that is certainly a really sweet photo. Happy Christmas! That thought crossed my mind when I saw the photo but luckily he didn’t get electrocuted! I love the way the tree lights have illuminated Matthew’s face. The photo is a treasure. The soft glow of the lights and his intent face make a lovely picture. I did decide to just use 1 photo per prompt unless I have a whole story to write. I can feel Matthews confusion and pain with those Christmas lights. I love this photo because it reminds me of a time my son got all tangled up in the lights when he too tried to help me decorate the tree. I just wished I had taken a picture of that moment. Beautiful photo! I think he’s pretty sure he is being a big help with those lights. A beautiful and even inspirational photo. I hope you take some photos tomorrow too. I wish you and yours a joyful new year. Children love to be involved to decorate the tree and also with some Christmas baking; Christmas is a highlight in the calendar. Love the glow of those lights around that sweet baby.